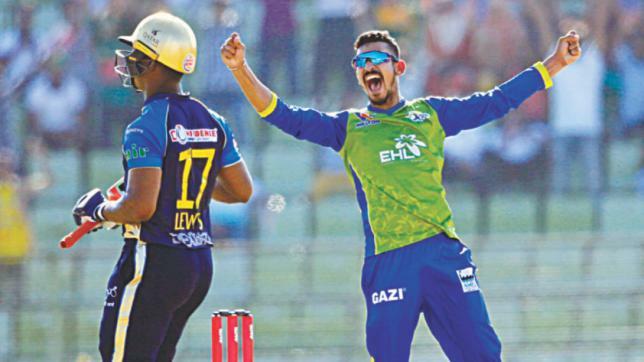 Skipper Nasir Hossain scalped his maiden five- wicket haul as Sylhet Sixers registered a thumping 10-wicket victory over Chittagong Vikings in the 37th match of AKS Bangladesh Premier League T20 held today at Sher-e-Bangla National Cricket Stadium at Mirpur. With this victory, Sylhet Sixers kept their hope of playing semi-final alive with nine points from 11 matches while bottom-ranked Chittagong Vikings remained at their previous credit of five points playing the same number of outings. Chasing a paltry winning target of 68 runs set by Vikings, Sylhet Sixers hardly had to sweat as they easily reached home in 11.1 overs with ten wickets in hand. The two Sylhet openers - Mohammad Rizwan (36 n.o) and Andre Fletcher (32 n.o) comfortable took Sylhet to the destination to remain unbeaten till the end of the innings. Rizwan hit six boundaries during his 33-ball stay on the crease while Fletchetr smacked four boundaries from 34 balls. Nasir Hossain of Sylhet was named the player of the match for his impressive bowling performance. Earlier, Nasir Hossain grabbed five-wicket as Chittagong Vikings were dismissed at a paltry total of 67 in 12 overs, the lowest total of this season's tournament, after they were forced to bat first by Sylhet Sixers. The all-rounder claimed five Vikings' wickets in his four overs, as his double strike in the very first over, saw the Vikings fail to recover from an early collapse. Nasir, after being hit for a six in the first ball by Ronchi, then took his sweet revenge as his second delivery slipped past the Ronchi's bat and clipped the stumps. In the last ball of the same over, opener Soumya Sarkar baked to the dressing room giving a return catch to the bowler. Luis Reece tried to put the pressure back on the bowling team but he was trapped leg-before wicket to Nasir in the third over, leaving Chittagong in a deep trouble. Sikandar Raza also lasted a little as he gave a brilliant catch at deep-midwicket off the bowling of Sharifullah as Vikings lost their fourth wicket only 21 runs. Nasir continued his onslaught as he trapped Tanbir Hayder leg-before wicket in the fifth over to get his fourth wicket and completed his fifth wicket haul dismissed Staan van Zyl. Nabil Samad then bagged three wickets for 7 runs as Chittagong were dismissed for the lowest total of 67. Besides, Sharifullah finished his spell with 2 for 23 runs from 4 overs.